As Giorgio Agamben establishes in Homo Sacer: Sovereign Power and Bare Life, human history can be summarized in terms of sovereign states separating citizens (with rights, privileges, protections) from “bare life” – mere human bodies excepted from the law and fully subject to the forces of the world arrayed against them. All you have, all you are, is you. So you make nice with the few people who’ll have you, and rely on them more than you should – but if you’re too cold or uncaring, they’ll turn on you. And if you care too much, the people who are after you will exploit them to hurt you. And if you cared about them at all, you wouldn’t care about them even a little. Sampat has framed the game as “heavily inspired by the American teleivision show Burn Notice and movies like the Bourne trilogy.” Some reviews have mentioned the game overstates this influence a bit, but I appreciate that the game knows where it is coming from and proudly wears this badge on its shoulder. The media that inspire the game are just a springboard, however, for a whole host of questions concerning our ability to function under stress – specifically the stressful conditions imposed by our would-be action movie – and what that does to our relationship to our environment, ourselves and, well, our relationships. 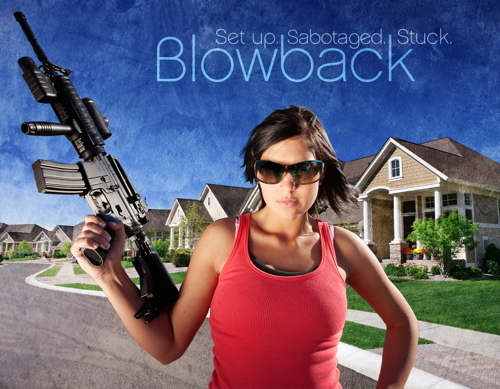 In Blowback, you play a mixture of Professionals and Civilians who have suddenly become interconnected by a botched mission. While this premise appears incredibly specific, it appears to be to the spy genre what the dame-walks-into-the-private-eye’s-office trick is to film noir: Salt (2010), Eye of the Needle (1981), The American (2010), The Replacement Killers (1998) — they’ve all got traces of the “botched job” trope. The GM plays The Agency opposite them, whose role is to turn up the heat under the characters at strategic moments, all the while teasing us with details about the botched job. The player-characters often find themselves caught between their past and present, with the future virtually unforeseeable (except as a repository for further anxiety). The game system itself puts you into a fairly rigorous but easy-to-follow flowchart of action, with a lot riding on the tense web of relationships generated in the early part of play (this is an indie game, after all). The dramaturgy of every session is structured by an individual Job — a man wants to be extracted from his company, a little girl hires you to track down the man who killed her father, whatever — that is further subdivided into the Analysis, Operation and Blowback phases. Each offer you a chance to indulge in all the cliches of the spy genre while inventing your own: Analysis is where you trick cameras and bribe informants, Operation is when your plan goes awry but generally alright, and Blowback is where you find out that it’s not okay for you to kidnap visiting state dignitaries and put them in your brother’s garage. You get a certain number of overall actions, and legible flowcharts within each phase let you figure out the consequences of your decision-making/dice-rolling. Game echoes of Cyberpunk or Shadowrun, where you assemble crack teams for jobs, mix with the television-relationship dynamics of games like Smallville or Primetime Adventure. As Sampat was on the playtesting crew for Vincent Baker’s Apocalypse World, her careful delineation of The Agency’s responsibilities in making the player-characters’ lives “not boring” remains in dialog with Baker’s game on many levels. Unlike Apocalypse World, however, “opportunities should always seem like the result of what’s happening in the game, not a result of the roll.” The game’s architecture insists that story remain queen of the realm. On the one hand, Blowback is all good guys, bad guys and explosions. And on the other, it’s all instant pain, hope and social critique. Honestly, what else are you looking for in a role-playing game? And beyond that, can any of us – Pro or Civilian – survive being cut off? This entry was posted on Wednesday, February 16th, 2011 at 5:59 pm and is filed under Book reviews, Books, Cool stuff, Games, Media. You can follow any responses to this entry through the RSS 2.0 feed. You can leave a response, or trackback from your own site.